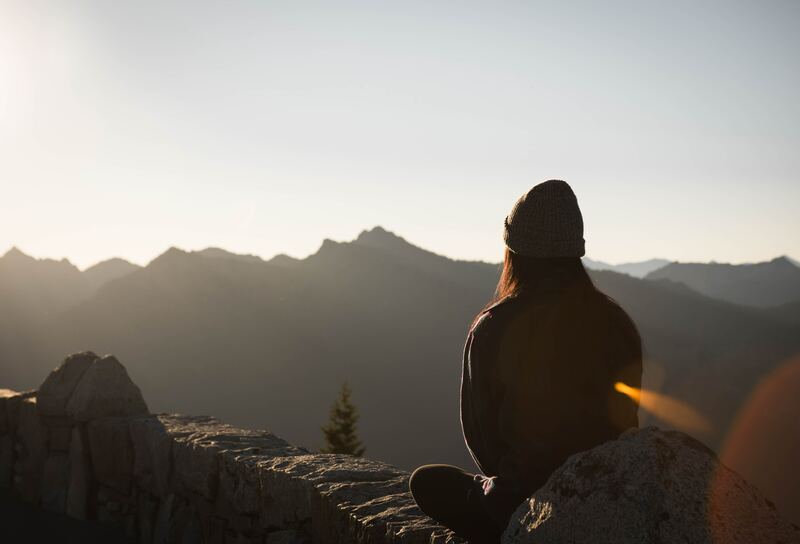 We all know the cheesy meditation stereotype: super-chilled guy or girl sits with their legs crossed by a beautiful vista, arms on the knees, eyes closed. Peace reigns (minus the three minutes it took to post the pic on Insta, of course). Pretty different to your average drizzly Thursday (not to mention your huge to-do list), right? As much as I’d love to be on that beach instead of at my London desk (duh), it’s stereotypes like these that can lead people to believe that meditation isn’t for them, unless they have somewhere quiet and beautiful to retreat to, and at least, oh, 10–30 minutes totally free. As a mindfulness meditation teacher and coach, one of the most-common reasons I hear from people who want to start meditating (to get all the awesome benefits) is that they really want to, but they can just Never. Find. The. Time. And when they do? They get bored, think about their next meeting, or fall asleep. Sigh. Yep, when it comes to busy professionals today, the struggle is real AF. We know the awesome theory of meditation, but the practice? Not so much. And yet, while I would recommend a “formal” sitting practice officially (because, to paraphrase that well-known Zen saying, the less time you think you have to meditate, the more you actually need it) “informal” mindfulness can be just as good. The key is to find “time pockets” in your day to focus on mindfulness techniques, even on days when sitting still feels impossible. If you couple your mindfulness automatically with habits you do anyway, finding the time becomes wayyy easier. Real talk: When you’re super stressed or busy, even finding time to go to the bathroom feels tough (been there!) but nature calls eventually. Even something as mundane as washing your hands after you go can be a great act of mindfulness and self-compassion. As you wash, feel the sensations of the soap and water — your bones, skin, nails; and appreciate what your hands allow you to do. When drying, note the warmth of the air; how it feels on your skin. Drop your shoulders, breathe, and notice the pause this gives you from your day. Even five seconds makes a difference. We tend to think of food as fuel when we’re super busy, and shove it down any old how. But you’ve got to eat and drink — and preferably without giving yourself hiccups or indigestion — so even if you’re in a rush, take a few seconds to mindfully sip, chew and taste — YEP, actually taste! — your food and drink. Notice the smell, the texture, the flavours, the sweetness, the aftertaste. You’ll either enjoy it more than usual, and feel more satisfied, or realise you actually want something slightly more interesting for tomorrow’s lunch. Win-win. If “I don’t have enough time” is the first thing people say to me, “I keep falling asleep” is the second. So, why not make this work to your advantage? Just before you drift off, create a new ritual where you lie straight in bed, concentrating on your breathing. Do a “body scan” and check in with each part in turn — foot, ankle, shin, knee, thigh, lower back, and so on — and then do it again, this time relaxing as you go. Be curious about how your body feels sinking into the mattress, and notice if you’re tensing anywhere. As meditation is proven to improve sleep you’ll be dreaming ASAP — and this time, on purpose, no extra effort required! And guess what, even if you feel like you never have any time, you can start meditating ASAP in just five minutes, even if (especially if) you haven’t managed to make it stick before! It’s totally possible for you. Right now, you can even win a FREEEE personalised guided audio meditation track tailored especially to your needs (worth £50 / 69)! All you need to do is take my 3-minute, super-quick survey here to enter the free competition now and share your experiences with meditation. No obligation — no pitch & no catch. You’d literally just be helping me help YOU. Win, win.